A couple of weeks ago, I posted how abc13 KTRK anchors Tom Koch and Melanie Lawson made a cameo on Who Wants To Be A Millionaire. Little did I know that was just the beginning! Now channel 13 meteorologist Collin Myers is playing the game as a contestant! "I had a fantastic experience meeting and working with [host] Chris Harrison, and the game is far more difficult in person than you’d think from watching the show," Myers told mikemcguff.com. "It’s also hard to think ‘out loud’ while answering a question-but you must, in order to fill the silence during the show. Overall, fun experience." Myers will be playing for one million dollars to be donated to charity, Living Water International, during "Play It Forward Week" Friday and Monday, Feb 22 and 25. "I chose Living Water International because they do excellent work for the underprivileged across the globe, and many don’t realize that they’re primarily based right here in Houston," Myers told me. In Houston, Millionaire airs 1:30pm weekdays on channel 13. Myers won't be the only TV staffer playing for charity. 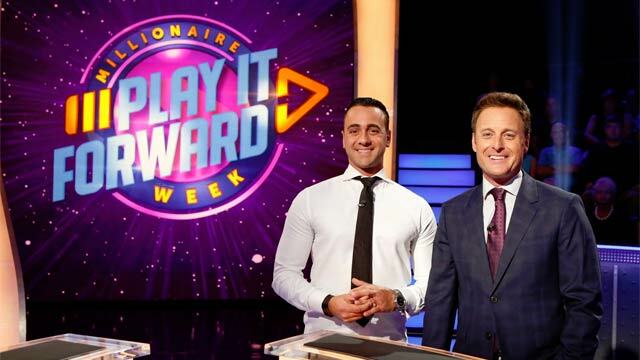 Five other local broadcasters from Who Wants To Be A Millionaire stations around the country will also play the game opposite Harrison during “Play It Forward Week. Steve Dunn, anchor at KATU-TV in Portland, OR will be playing for Meals on Wheels. Krystal Allen, co-anchor at KSNV-TV in Las Vegas, NV will be playing for St. Jude Children’s Research Hospital. Danny Romero, weathercaster at KABC-TV in Los Angeles, CA will be playing for East LA Rising. Pat McGonigle, anchor at WDAF-TV in Kansas City, MO will play for Love Fund for Children, and continues his gameplay on Thursday, February 21. Margot Kim, co-anchor at KFSN-TV in Fresno, CA will be playing for Marjaree Mason Center, and continues her gameplay on Friday, February 22. Collin Myers, meteorologist at KTRK-TV in Houston, TX will be playing for Living Water International, and continues his game play on Monday, February 25. This season, the game show will give away more than $100 million in total winnings since its syndicated debut.